The Tardent Family from Ormont-Dessous, Vaud, Switzerland. These pages are intended to be a brief overview of a family saga, the beginning of which is lost in the mists of time. However we do have records that places the family in the Ormonts Valley, from the late 15th century. The last landholdings in the valley, at least in the Tardent name, were probably in the late 19th, early 20th century. There are a couple of chalets in le Sepey with the Tardent name, of varying ages. One Tardent chalet in Cergnat was burnt down on August 1st, Swiss national day, in 1988, and an old Tardent grenier stands today next to the church in Cergnat. However the beginnings of the story are at least 500 years old, according to the recorded history researched and compiled in the 19th and 20th centuries by Tardents with an interest in their origins. Historical documents indicate that the association may well have been much earlier, in accord with the settlement at Le Sepey. 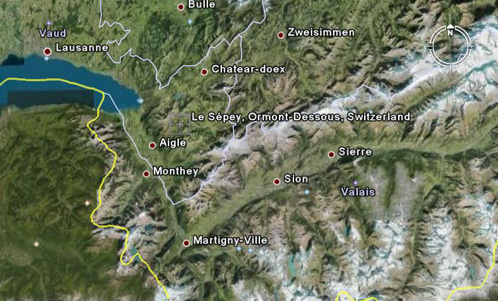 The Ormonts valley is surrounded by the Vaudoise pre-alps, steep mountain escarpments tower above. The valley runs into the upper Rhone river plain, in a dog-leg configuration, carved out by the Rhone glacier during the last Ice Age, (the remnants of which are receding very rapidly due to global warming). People who went to live up in the challenging and often hostile mountains usually originated from the Rhone plain, the Chablais district (from the Celtic Pennoslacos, later latinised to caput laci, head of the lake), the fertile alluvial region around the Rhone from St Maurice to the shores of Lac Leman into which the Rhone flows. On the other side of the corridor is the French regional department of Haute Savoie. Along this corridor is an ancient route, originating in Italy as a passage through the Alps. There has been a steady stream of traffic, for migration and trade purposes for thousands of years. Indeed, the route ran across the Alps from Italy, over the St Bernard Pass, along the upper Rhone valley and across to France, to Brittany and other destinations from Celtic times. At some point in recent ages, during Celtic, then Roman times, some people have moved up into the mountains, for one reason or another. Perhaps land was becoming short on the plain, perhaps fleeing hostility and aggression from conquest and fort-main, perhaps simply because of a pioneering spirit of adventure, and most probably a mixture of motivations. What is interesting is that there are words that survived to the twentieth century that are not French in origin, that were used only in the Ormonts Valley, suggesting that the Celtic people moved to the valley from the upper Rhone valley earlier than once thought, for hundreds of words to survive intact from a Gallic dialect that must have been in use in the late Iron Age before the Romans arrived. The earliest record of the Tardent name appears in 1398 A.D., a land record for 'Sertardent', from the French essert, a clearing - literally, Tardent Clearing, still a place name in Le Sepey today. The family genealogy starts in 1505. transcribed originally from the records of Ormont-Dessous by David Tardent (, the schoolmaster of Vevey, in 1815, and edited, annotated and extended by Henri Alexis Tardent, academic, of Le Sepey, and later of Australia, in 1887. (See Henri's Account in the history pages of this site. Henry's interest in history was stimulated by correspondence with his distant cousin Louis, of Paris). Sadly, these records are now lost owing to the outbreak of fire in 1866, a 'red rooster' (as it was known locally) that destroyed all the communal records held in Le Sepey, the oldest and most enduring of villages in Ormonts-Dessous, the lower Ormonts Valley. When the Tardents did first arrive in Ormonts-Dessous, we do not know. Certainly the Tardent genealogy is tightly bound with the other early families of Ormonts - Dupertuis, Chablais, Monod and Mermod. Henri wrote, in the late 19th century, that the historical evidence pointed to a Savoyard origin for those families, supported by a preponderance of Savoyard Catholic christian names in the early years of the genealogy. However, the family DNA, not limited by patrimony, no doubt comprises all the blood lines of the last millennium that existed in the region. Who knows, perhaps the mountains had settlements much earlier than the times of the abbey at St Maurice, and the fiefdoms of the Counts of Savoy centred in Villeneuve and Chillon. Bronze age relics have been found in the valley, and place names of Celtic origin. There is currently no archeological evidence to indicate settlements in the Roman periods or in the early middle ages, but that is not to say there was no established habitation. However the country was definitely hostile, very cold, thickly and steeply wooded and inhabited by wild animals such as bears, wolves and lynxes. There have been quite a number of theories advanced as to the origins of the name, from speculation on the French word tard, meaning late, similar place names, such as Fere-en-Tardenois in northern France. Then there was a French scientist called Jean Tardin who published in 1618 a learned treatise on the properties of a bitumen fountain in Provence, however this surname probably is of the same origin. Research in the 20th century indicated that all found instances of the name Tardent, Tardain,Tardin were branches of the Tardent family of Ormonts. According to Chapter XXXI, of the book "Histoire Des Francs, Volume 1, by Saint Gregory (Bishop of Tours), written around 580 AD, in a chapter entitled "Chateau de Tauredun", he tells the story of a strange rumbling coming from the mountain for sixty days, before it fell engulfing the chateau and all its surrounds and people. Afterwards, when a party of monks were investigating, another fall buried them too. This occurred in 563, from several sources. Now quite small and called Grammont (literally grand mountain) it was originally Tauredun'um, derived from Taure, the bull and dun'um, a fort. It is plausible that some people left the chateau on hearing the mountain making loud noises, and since family names were usually place names, that our ancestors referred to themselves, subsequently, as coming from "Tauredun". This seems to be the most plausible explanation, as most surnames in the region are place names, and this chateau, and mountain are the only known place names with the same phonetic pronunciation as the modern French "Tardent". Spelling frequently changes over the ages. Marius of Avenches also recorded these events. The site of this chateau is near the head of Lake Geneva, close to Villeneuve, and around 20km from Le Sepey, in canton Vaud. In all probability what would have influenced the groups of people to ascend into the mountains would have been the imperative search for new land because of population expansion, and also the incentive to leave living conditions on the plain below, perhaps escaping political circumstances, such as hostility and disputes. There is a legend in the family, passed down orally from the 19th century to modern Tardents, that the Ormonts Valley was founded by some members of a Roman Theban legion, probably stationed at Saint Maurice, who had escaped being put to death on the order of the Roman emperor. There is some evidence that monk historians believed that many of the men escaped death by fleeing to the mountains. What is fascinating, however, is that within the next twenty years or so, the advances in genealogical analysis, and the collection of significant population samples, mean that we will probably be able to determine exactly whether this is true or not! All mountain villages grew from groups of chalets gathered together for mutual protection against the hostility and extremes of the environment, for example being snowed in for months at a time during harsh winters. The real mountain people were typical of those who live in difficult alpine terrain - tough, uncompromising survivors, often with a great store or courage and kindness, as well as being hardened by the elements. Even today, the young people of the area, young men and women, pride themselves of their feats of physical daring, these days involving snowboards and skateboards, and steep and dangerous self-imposed challenges. The region of Vaud (from the German Waadt, woods), of which the Ormonts valley is part, has a long history, from the Celtic Helvetii lake dwellers, Romans, Burgundians, Franks, Carolingians, Zahringens, before the Savoyards arrived around 1218, and finally the Bernese in the 15th - 16th century. Subsequently the revolutionary French troops arrived, and the Lemanic republic was proclaimed. 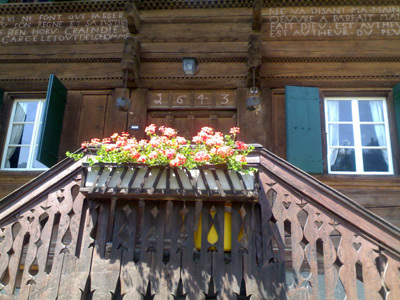 In the 19th century, Vaud joined the Swiss confederation in 1803. The Tardents, like many mountain people, were, by all accounts, (and still are, apparently), individualistic, and mindful of their political and social rights. One story about a Tardent during the brief feudal period of the Bernese predominancy, recounts of an order to a Tardent man to wear a uniform. The enterprising man objected on the grounds of an earlier law granting exemption. He won his case. Tardents have often had the gift of the gab, and many have been raconteurs, and in the last few centures, writers and academics. 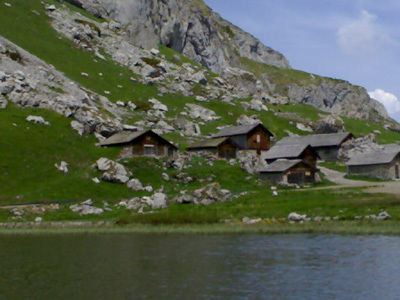 The village of Le Sepey has at least been inhabited at least since the 12th century, according to Lausanne University library records, sighted during the 20th century history compilation, now unable to be located. It is situated closest to Aigle on the plain below, and may have been the original base for expansion into the higher country. Land records indicate Tardent men and women owning land parcels all over the Ormonts Valley. Practically speaking, there are excellent walking tracks all over the valley, that have been in use since settlement. The tradition of taking the cows, sheep, goats and pigs to higher pastures during the summer would have commenced in the early days of the valleys habitation. Mountain huts existing today are probably successors of early huts for the shepherds. The cows, the most valuable and necessary possessions of the montagnards, were once housed in the ground floors of the chalets. They were essential for survival during the long winter, and were treated almost as part of the family! Quel est Le Salaud Qui m'a Poussé? 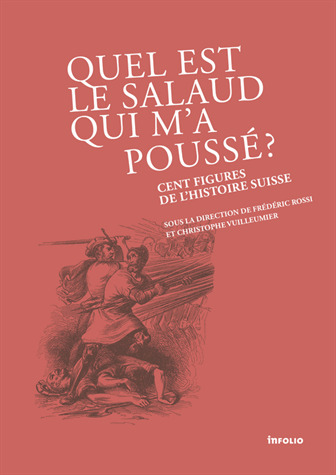 Cent Figures de l'Histoire Suisse - Sous la direction de Frédéric Rossi et Christophe Vuilleumier. Henri Tardent of Vernay, of '"Au Vernay", Cergnat in Ormonts-Dessous is honoured in this book for providing the text of Swiss articles to the Australian Government for inclusion in the Australian constitution. The Ormonts Valley (La vallée des Ormonts) is part of the Pre-Alpes Vaudoises. 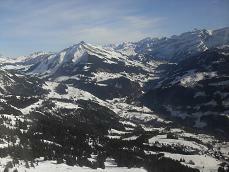 It extends from Aigle to the foot of the Diablerets massif, a length of 26 kilometres. The tributary of the Rhone, La Grande Eau cascades along its length, fed by melt water. Today, all that remains besides the bones of Tardents buried around the church in Cergnat, are a chalet in Le Sepey with the name and a beautiful inscription in old French over the door, and a place close to Le Sepey still known as Le Scex Tardent (the Tardent clearing). So much of today's landscape is the result of many centuries of hard work of the mountain families who carved out their existence from the forests, gradually clearing pasturage for the livestock, cattle and goats, into a lifestyle that was, of necessity, in rhythm with the seasons. Winters were especially harsh, and the activities of the whole year were targeted towards the survival of a winter in the mountains. So what was happening to the Tardent family if indeed their roots are in the Chablais, the region at the head of Lac Leman, at the opposite end from Geneva, during pre-history? Here is some information, including facts found in the publication "Le Chablais dans les pas des archeologues" - Carine Wagner, published by the Association du Chablais. As well as an overview of the archeology of the Upper Rhone Plain, it contains maps and guides, so that one can walk on ancient paths, and view sites of interest for oneself. The walks around Saint-Maurice, pointing out Celtic sites of interest, as well as the Romain remains of the military outpost. (Nearby is the site where the reported massacre of St Maurice, declared a catholic saint, and the Roman Theban legion, occurred purportedly around the year 286 A.D. In brief, because of the glaciation, there is little earlier evidence of humans in the Alps. However stone and flint tools dating back to 35,000 BC were found in a cave 1800 metres above Vouvry on the French side of the Rhone plain. Some bone relics of numerous animals around 12,000 to 13,000 years ago, after the retreat of the glacier, date the existence of a band of hunters who established themselves around Villeneuve at the head of the lake. They were replaced by Magdalenian hunter-gatherers of western Europe after red deer, horse and other large mammals. They roamed seasonally, perhaps had trade routes, and were the same people who drew the cave paintings in Lascaux. After the end of the last Ice Age, from 9,000 BC. BC, Mesolithic hunters colonized the valley in two ways, from the high altitude passes and Italy, and through the lower Rhone valley from France. The Neolithic agro-pastoral economy of Valais, was originally inhabited via the passes connecting the Alps to the Po plain, possibly related to the practice of summer pastures for small livestock at higher altitude. Between 9000 and 6000 BC people lived in stone shelters in the Chablais, and lived off the plain and the wooded slopes above it, hunting cerf, bears, wild cats, tortoises, birds, gathering birds eggs and nuts, clothed in animal furs. Their tools were mainly finely worked flint gathered from the mountain massifs, such as Les Dents du Midi (literally, the teeth of midday). Perforated shells from the Mediterranean have been found in the region, evidence that people were roaming far and wide, in search of new territory. The end of the ice age had meant that trees could once again flourish in Switzerland. The upper reaches of the Rhone flow through what is today a wide plain bounded by rising mountains, where once there was a vast river of ice. Cultivation techniques, the invention of the wheel, and the establishment of settlements on this fertile plain commenced in earnest around 5000 BC, as people followed migration paths from southern France, from northern Italy, and along the Rhone river itself to reach the lands around the shores of Lac Leman, and the vast valley plain carved out by the glacier. The early Neolithic period from around 5500 BC is characterised by a superior use of tools, enabling a more settled existence than our nomadic hunter gatherer ancestors. Comparatively sophisticated stone axes, allowed timber to be felled for houses. Clay started to be fired and cooking pots promoted a more varied cuisine. Evidence from around 5000 BCE indicates that agriculture commenced around this time, at least at Sion, and that groups of people wandered north from Italy through the Alpine passes, suggested by the similarity of cooking utensils to those found on the Po river plain, south of Venice, attesting to the initiatives of the people to move in search of new opportunity. During the late Neolithic period, (around 4,500 to 3.500 BCE) there is evidence that the Chablais was inhabited, particularly at sites at St Triphon and Collombey, a few kilometres from Aigle. Some settlements show domestication of goats and sheep, and artefacts in glass and polished stone, though the hunt was still very important. The dead were buried in stone edged graves, and hills above Aigle were places of significance to the locals, perhaps as gathering places, perhaps for ceremony and communication. Early Bronze age objects dating from around 2000 BC, have been found in the upper Rhone Valley, and there were three distinct regional groups, the earliest of which was established in western Valais at the end of the valley furthest from the lake. No longer was the valley just a migration route over the alps, but an area with its own character and its own culture and style of development. In the Chablais, tombs and various artefacts such as bracelets, spirals, pins and diadems (a kind of headband) have been found at St Triphon, mostly from the 'classic phase of the Civilisation of the Rhone' between 2000 and 1800 BC. The objects, weapons and ornaments, are much more sophisticated then earlier objects. Settlements began to be surrounded by defensible stone walls. 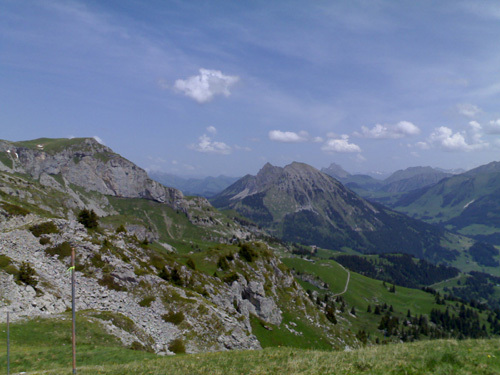 The early iron age from around 800 BC shows little evidence in the Chablais. It is not known if and why the region became more sparsely populated at this time, possibly this was due to variations in climate, e.g. a cold spell, as the next clear evidence appears around 600 - 500 BC. Fortified establishments around administrative centres were surrounded by tombs rich with objects such as weapons, jewellery and decorative objects, from a trading class who had cornered the market in metals and organised commercial traffic to places such as Cornwall, Brittany and the Baltic. This was a very busy time of exchange of goods including bronze and ceramic vessels, and amphoras of wine imported from Italy, Greece or Marseilles. This is very possibly part of the emergence of the Celtic civilisation. Ornaments found locally are like those of places as far away as the Mediterranean, eastern Europe, and Italy, indicating that the alpine passes of the pre-Alps and Alps played a part in the trade routes. When the Romans arrived in the upper Rhone valley, they established a centre at Martigny, because of its strategic location, due in part to their desire to shore up communications between Italy and Germany. The diverse and separate groups of local plain and alpine inhabitants in fact were united administratively under the occupation, and there are indications that the four distinct regional groups perhaps had a gathering place at Massongex. The Germanic peoples were the next to try to invade in 260, an attempt that was rebuffed. However it was not until 401 that the legionnaires abandoned their camps, ending the Roman occupation. The Burgundians in Savoy next became the dominant force. The Burgundians are thought to have originated in the Baltic region around the Oder River in Poland, and they gathered around Geneva, having displaced a number of local peoples on the way. Their territory grew and grew, to include not only today's French side of Lac Leman, but also a significant part of the Swiss shore as well. 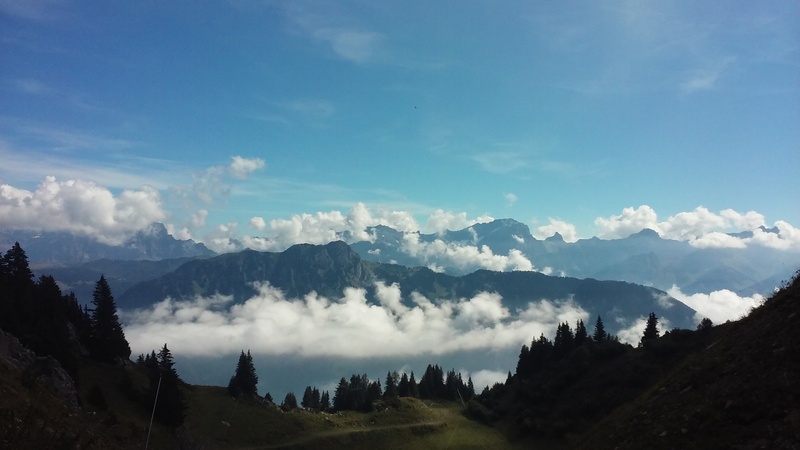 Christianity started to play a part in the Chablais. A monk called Ambroise claimed to find the bones of St Maurice and a massacred Theban legion, following a vision, at the end of the 6th century, or so local legend has it. St Maurice became an important religious centre for many centuries. Not a lot was recorded during the early middle ages. Best sources of information exist because of the abbey of St Maurice of Augane, such as the Chronicles of Marius of Avenches, and History in 10 volumes by Gregoire de Tours, and letters and legal documents, and texts about religious figures. The treasures of the Abbey of St Maurice are displayed in the Abbey museum. A wonderful collection of artefacts from the neolithic, bronze and iron ages found in Canton Vaud, the Cantonal Museum of Archeology and History, Palais de Rumine. 'Earth to Climate Change' traces the effects of climate variability on our past, present and future adaptations to social, political and climate factors since the last glaciation. Deeply simple solutions are available, and can provide a clean technology blueprint for the future. Inspiration for responding to the threats of extreme weather events, the risks of disaster, and the associated large-scale migration of populations is as close as our family tree. Past events can show how global temperature rises affect us all, as Earth, the beautiful planet, balances the biosphere from the changes we humans have made over past millennia. We don’t have any realistic alternative, we can either work with climate change or live with the consequences.